At the beginning of the year I discovered (via YHL) an artist on etsy who does custom house portraits with a whimsical flair. It took me less than 10 seconds to decide I wanted a picture of our house done and what a cool tradition it would be to have our future houses done as well. Apparently, the rest of the world is of the same opinion because Rebekka Seale is now booked solid for custom house portraits, but luckily, I got in early enough to just have gotten mine in the mail this week!!! I am head over heals for it! 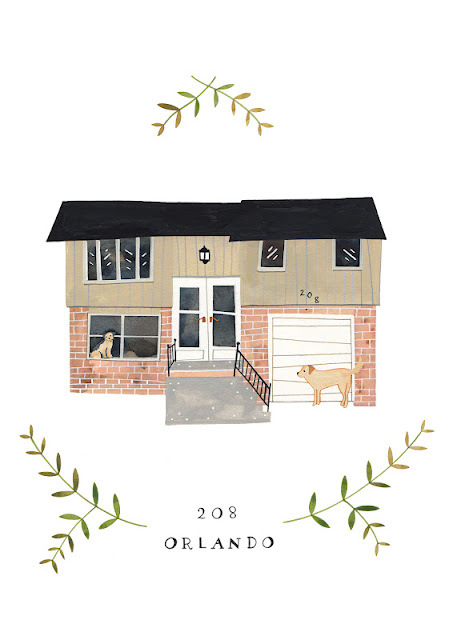 This is my first piece of "original" purchased art and to have it be of my own (and first) home, complete with my two favorite little doggies makes it extra special! Don't you just LOVE it?!?!?!!! Again, I love how it turned out and I love the whimsical flair! Not only did I get the original art, but also the image on cd with instructions for printing post cards. So be prepared, I'll be sending those babies out right and left to anyone who's address I can get a hold of! :) haha!